So. I am very upset with Dairy Queen. 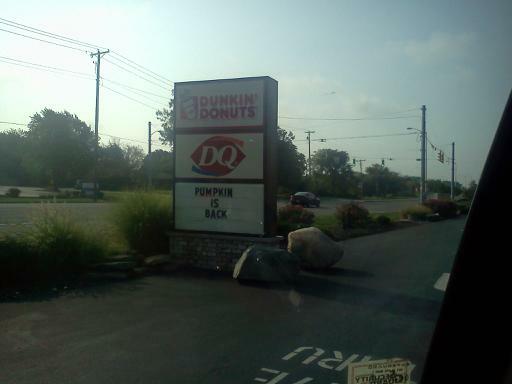 Our DQ shares a parking lot with our Dunkin' Donuts. Now don't get me wrong, we don't live in a little hick town (I guess that would be my opinion, I'm sure lots of people think we do) and this isn't our only DQ & DD. They have the same parking lot, so of course they share the same road sign. I was driving past the other day and the sign said "PUMPKIN IS BACK", so naturally, I flipped out, posted on Twitter and absolutely lost my mind believing I would be the next person to get a Pumpkin Pie Blizzard. Joshua made dinner last week and after, a Blizzard sounded fantastic. We get there, go through the drive through (which was necessary because I had already taken my bra off and there is no putting it back on) and Josh orders it for me. The fourteen year old working says "that sign is for next door, we don't get our pumpkin until October". I was so angry. Soooo angry. 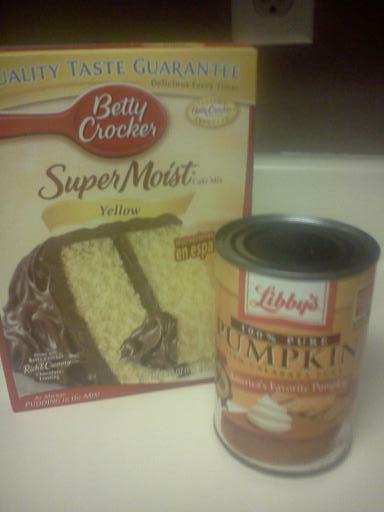 The point of my story is, I've been craving pumpkin ever since. Josh went to our friend's house on Monday and his mom had made pumpkin cupcakes. I went down, and I kid you not, by the time I got there they were gone. Gone. It's like I'm being taunted by the pumpkins of the world. It is unjust. So I've been whining about how bad I want pumpkin, how bad I need pumpkin, and finally got sick of listening to myself. And I did something about it. 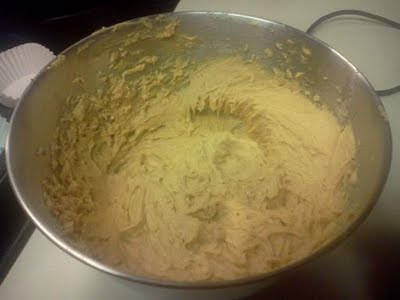 Mix together the ingredients with an electric mixer. It looks like this. Don't add egg. Don't add water. Don't add oil. One box of cake mix. One can of pumpkin. 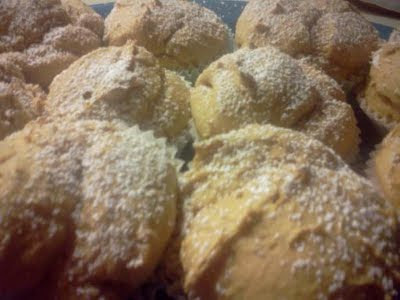 These would be fantastic with cream cheese frosting, but our kitchen was all out. 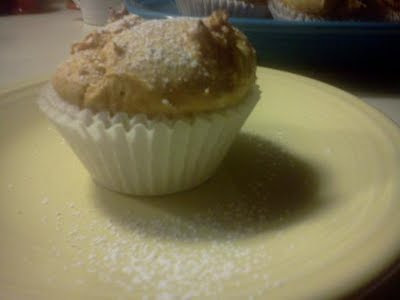 I improvised and used powdered sugar instead. I love these. And they're so dang easy.